The Tahoe Truckee housing market is trying to take advantage of the unseasonably warm and dry weather. Perhaps not to the level that one would think though. This time last year there was snow piled as high as you could see and there was likely more on the way. This year it is nearly t-shirt weather out there and very little snow to be found. January sales saw a very modest 10% increase over last year. Since last years snowmageddon didn’t really start until early January perhaps the February sales will start to show the difference more. Things that may keep sales volume in check this year are volatility in the stock market, higher interest rates and even lower inventory then last year. The volatility in the stock market this past couple weeks has been serious but perhaps also over due. It is being driven by the raising interest rates which have been talked about for years. It is just now finally happening. This is impacting mortgage rates but maybe not to the extent you may be thinking. Even with the increases I have yet to see a 30 year fixed conforming rate above 4.5%. Let’s keep in mind historically that is still an exceptional rate. Possibly most important of all is going to be the very limited active inventory and values. To give some perspective, when I search all of the Lake Tahoe North and West shore our local multiple listing service covers there are just 66 homes available and nearly half of those are listed for a million dollars or more. In the greater Truckee area there are 77 single-family homes available and 80% of those are over a million dollars. 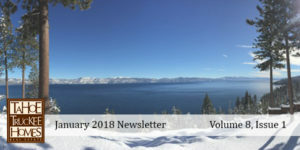 Finally Tahoe Donner is likely setting a new record low inventory at just 23 and 30% of those are over a million dollars. I guess this explains the area average sale price of $1,339,961 for January. Yikes! What is all this setting the market up for? I suspect with the increase in interest rates more folks are likely to sit tight in the current homes. This could mean even less inventory than we have had in the recent past. With what appears to be no decrease in demand so far for even fewer homes adds up to further appreciation. That is fine as long as we can keep that in check. Honestly the last thing I want to see is the unsustainable increases we saw in 2004 and 2005, which lead up to the bursting real estate bubble. I am all about slow and steady. Needless to say, if you are thinking about selling this is a great time. If you are thinking about buying don’t think to long or you may very well be paying more.